Roald Dahl was born in Llandaff, South Wales on September 13th 1916. His parents were Norwegian, and were called Harald and Sofie. He went to Repton school, in Derbyshire, and left school in 1933. His first job was in Africa, with the Shell Oil Company. In the second world war he fought as a fighter pilot, and was badly injured when his plane crashed. After the war he worked in America, and soon started writing stories. His very first children’s book, written in 1943 was called The Gremlins. Eleanor Roosevelt, the wife of the President of the USA liked it so much he was invited to the White House and became friends with the President, Franklin D Roosevelt. He wrote a number of books and short stories for adults, many of which were televised as the hugely popular Tales of the Unexpected. But it was as a children’s author that he found greatest fame and satisfaction, saying “I have a passion for teaching kids to become readers…Books shouldn’t be daunting, they should be funny, exciting and wonderful.” Millions of fans around the world agreed and have chuckled and gasped at his amazing stories. His mesmerising stories, written in sizzling, sparkly language, will lead you into adventures you’ll never ever forget! From 1945 until his death, he lived at Gipsy House, in Buckinghamshire, where he wrote his famous children’s books. He died in hospital in Oxford, on November 23rd, 1990. His books have continued to be read and loved, and have been made into a number of hit films, including Matilda and Charlie and the Chocolate Factory. You can even visit the Roald Dahl Museum in the village where Dahl lived for most of his life. 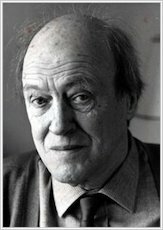 In 2009 the Roald Dahl Funny Prize was established in his memory. What’s it like writing a book? When you’re writing it’s rather like going on a very long walk, across valleys and mountains and things, and you get the first view of what you see and you write it down. Then you walk a bit further, maybe up on to the top of a hill, and you see something else, then you write that and you go on like that, day after day, getting different views of the same landscape. The highest mountain on the walk is obviously the end of the book because it’s got to be the best view of all, when everything comes together and you can look back and see everything you’ve done all ties up. But it’s a very, very long slow process. How do you get the ideas for your stories? It starts always with a tiny little seed of an idea, a little germ, and that even doesn’t come very easily. You can be mooching around for a year or so before you get a good one. When i do get a good one, i quickly write it down so that i don’t forget it, i don’t dash up here and start to write it. I’m very careful. I walk around it and look at it and sniff it and then see if i think it will go. Because once you start, you’re embarked on a year’s work and so it’s a big decision. My work routine is very simple and it’s always been so for the last 45 years. The great thing, of course, is never to work too long at a stretch because after about 2 hours you are not at your highest peak of concentration so you have to stop. Some writers choose certain times to write, others [choose] other times and it suites me to start rather late, i start at 10 o’clock and i stop at 12. Always. You have to keep your bottom on the chair and stick it out. Otherwise, if you start getting in the habit of walking away, you’ll never get it done. What is the secret to keeping your readers entertained? My lucky thing is i laugh at exactly the same jokes that children laugh at and that’s one reason i’m able to do it. I don’t sit out here roaring with laughter but you have wonderful inside jokes all the time and it’s got to be exciting, it’s got to be fast, it’s got to have a good plot but it’s got to be funny. And each book i do is a different level of that. The fine line between roaring with laughter and crying because it’s a disaster is a very, very fine line. How do you create iteresting characters? When you’re writing a book, with people in it as opposed to animals, it is no good having people who are ordinary, because they are not going to interest your readers at all. Every writer in the world has to use the characters that have something interesting about them and this is even more true in children’s books. I find that the only way to make my characters really interesting to children is to exaggerate all their good or bad qualities, and so if a person is really nasty or bad or cruel, you make them very nasty, very bad, very cruel. If they are ugly, you make them extremely ugly. That i think is fun and makes an impact.